There is more of what to do than the self poses in front of the iconic landmark of Seoul – the Namsam Seoul Tower. As one of the tallest towers in the Orient, it is almost 480m above sea level and is one of the most visited tourist attractions in the city. The tower was first established as a broadcast tower to send out TV and radio signals in 1969. Today, it also serves as a multi-cultural venue in the city and a place for relaxation for friends and families. What makes the Namsam Seoul Tower interesting is apart from the restaurants and recreational centers that it offers, there are corners worthy to be immortalized in the form of Instagram-worthy pictures. The “locks of love”, situated at the wooden viewing deck of the Roof Terrace on the second floor, is one of the popular areas of the Namsam Tower. Having been depicted in many Korean television shows, dramas and movies, the visitors hang locks to symbolize eternal love. The tower fence is interestingly surrounded by pictures as well of varied visitors, with the hope that someday they will find eternal love by leaving their pictures on display. Is it really possible? Whatever. There are heart-shaped chairs to lounge and do the photo shoots as well. The roof terrace is surrounded by installations themed mainly on love. Situated at the 3rd Floor of the Namsam Tower, the observatory offers a 360-degree panoramic view of the city. Day or night time, the experience is worth the admission fees (10,000 won). It also showcases 600 years of Korea’s history through 32 LCD screens. What is even more entertaining is the elevator leading to the observatory likewise offers digital effects and sounds in a matter of minutes. 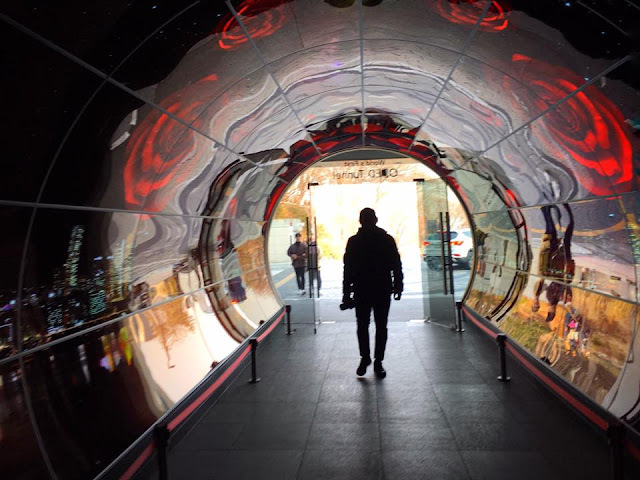 At the ground floor of the Tower, the LED Tunnel serves as a grand welcome. Not really that remarkable but claimed as the world’s first LED Tunnel, and so we passed through it for documentation purposes. LG Electronics and LG Display is responsible for the installation of this OLED (organic light-emitting diode) structure. A total of 248 55-inch OLED panels were used in the installation. OLED panels are actually displayed all around the Namsam Tower from level 1 to 4. On level 4, there is a 24m long wavy structure decorated with images of wish lanterns, flames and patterns of dancheong to represent the skies of Seoul. Right next to this structure is the 3D World, where we get to experience state of the art technology of 3D videos that can be filmed from different angles simultaneously and interestingly for free. Interesting feature for K Pop fans are the photo booths on the 4th floor, where you can have your photos taken with your choice of K Pop stars. For printed copies of 5,000 won, we tried it. Who would have thought that there is a park in a destination which is a Tower? This is one of the interesting features of Namsam Tower. Surrounded by souvenir shops, restaurants and art installations, next to the roof terrace is an open space for other visitors to lounge and people watch. Some even hold picnics on the area and do their usual photoshoots. At the second floor of the observatory is the highest restroom in Seoul. This is the only restroom with a panoramic view of the city and it is called the Sky bathroom. If you do not want to compete for space with other visitors in the observatory itself, then at your own privacy, you can enjoy the cityscape and skyscrapers at the restroom. This trip is made possible by Cebu Pacific Air. Cebu Pacific Air flies to Incheon daily from Manila, Cebu and Kalibo. Check their website regularly for promo updates.